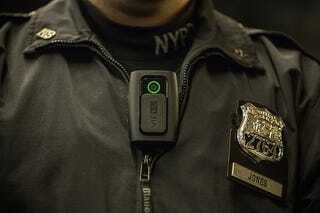 The New York City Police Department’s largest officer union reached a $1.88 billion tentative deal with New York City Mayor Bill de Blasio this week that will require all patrol cops to wear body cameras by 2019. The deal increases the average rank-and-file officer’s salary by 11.73 percent, and the average member of the Patrolmen’s Benevolent Association will get $12,235 in retroactive pay under the deal, according to Newsday. The higher salary will be offset by lower salaries for newly hired officers, officials said. The last NYPD contract with the city of New York expired in 2010. Since then, the union has played hardball with the mayor—picketing the official mayoral residence, as well as his gym and other events, to protest the fact that they were working without a contract. The city had already outfitted at least 54 officers with body cameras—the result of a federal court order mandating their use. In 2013, U.S. District Judge Shira Scheindlin found that the NYPD’s stop-and-frisk practice violated the constitutional rights of nonwhite New Yorkers. The Wall Street Journal reports that the NYPD began the body-camera pilot in 2014, with trials at six commands throughout the city. According to the Journal, the city plans to expand the program to 1,000 officers this summer. What has not been agreed upon with this deal, however, is exactly when an officer must keep the camera on and how footage will be stored or released to the public. Officials said that those details will be hammered out later. Read more at Newsday and the Wall Street Journal.